Villano I (José de Jesús Díaz Mendoza, some sources mix up the order of the surnames and have Mendoza Díaz which is wrong, as Ray Mendoza actually got the "Mendoza" part from his wife's name as he thought that it had a better sound for wrestling) was 49 years old, which is younger that one may expect, as Arturo himself is just a year younger. He died around 12:00 PM in his house, located at the Oriente St. 154, number 227, at the Delegación Venustiano Carranza of El Distrito Federal (Mexico City), while recovering from the brain surgery he had on December 13, 2000 to fix a coagulum. He was doing fine and even though he had a relapse, he seemed to be alright now. He was happy, and was working hard to get into shape so he could have a retirement match at Arena Mexico teaming with his three brothers. The official cause of the death is a heart attack caused by a cerebral haemorrhage. Doctora Guadalupe Ramírez from the ambulance UM 536 of the urgencies squad confirmed the news. He's surivived by his widow, Delia Valero (who is the daughter of Héctor Valero Meré, a legendary lucha magazine writer/owner of the past), his two daughters Alma Delia and Blanca Olivia, plus his brothers and father. His corpse was at the funerary Gayosso Sullivan until today (5th of January) around 12:15 PM when they carried him to the Panteón Francés de San Joaquín. Dozens of wrestlers (including Los Brazos, Perro Aguayo, Cien Caras, Universo 2000, Mascara Magica, Fantasma, El Signo, Felino and Ringo Mendoza) attended the funerary services and were there to say the last goodbye to their good friend. As requested by the family, he was buried with his mask on and wearing his Villano cape with the UWA logo. This is quite ironic, but yesterday (4th of Jan., 2001), Ray and the other three Villanos gave an speech at the Hospital Obregón (located at Colonia Roma) about the risks of the sport, after Villano V had had successful knee surgery there a day before. They also spoke about Villano I's brain surgery as a side-effect of the years of head bumps in the ring. When they arrived home, they were told the bad news. They apparently had plans to film a TV doccumentary about the risks of lucha (Ray and the Villano's have suffered TONS of career threatening injuries), but I don't know if those plans will still go on. The Villanos I and II started trained together in 1961 with Bobby Bonales at different venues in the districts of La Lagunilla and Tepito. During his youth, Villano I studied at the Escuela Superior de Educacion Fisica (Physical Education High School) and got a degree. He eventually became a P.E. teacher there too. Villano wanted to be a part of the wrestling team for the Mexico '68 Olympics, but he couldn't get into the team so he and V-2 turned pro during sometime the first three months of 1969. Apparently Ray didn't want them to become wrestlers unless they had a degree, so they wrestled as the masked Bestias Negras I/II (Black Beasts) without their father knowing. Now I don't know if I should believe this history of them being wrestlers and their father not knowing, however all the Villano wrestlers have degrees. Anyway, he also wrestled as Toro Bill (Bill the Bull) and El Villano, until at some point during late-70 or early-71 when they finally switched to Los Villanos I and II. At the start they mainly wrestled out of Naucalpan until they signed with EMLL where they competed mostly at the Arena Coliseo and became Arena Coliseo Tag Team champions. All the Mendoza's departed to the newly created UWA in 1975 where the Villanos, especially Villano III, became big stars. During the "trios" boom in the early 80s there wasn't a regular Villano trio though, as Villano II "disappeared" and Villano III was a singles star. Villano I mostly teamed with his father in tag team competition until Villano IV started to wrestle with that name in early 1983. They were El Toreo regulars, but mostly competed the undercard (with the huge amount of talent and foreign imports they had, it wasn't uncommon to see El Hijo del Santo or Los Villanos in the first or second match of the night). The only major singles title he had during his career was the UWA World Light Heavyweight title he captured on August 10, 1986 defeating Fishman at El Toreo. He lost the title on January 17 of the following year in the same place to Loco Zandokan (the original one, not the current one who is his brother Huichol). During his career he also won several masks, the most important being the ones of El Cóndor, Scorpio Sr., and Los Brazos (El Brazo, Brazo de Oro and Brazo de Plata). 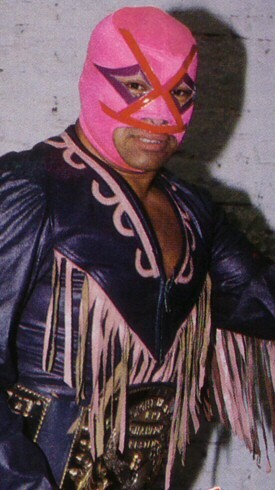 After the death of his brother in 1989, he lost his heart about lucha, though he still was an active wrestler because he was a company man and the UWA needed him. However, he didn't wrestle a full time schedule and spent a lot of time as a P.E. teacher, and as an amateur wrestling teacher in a lot of gyms, like the Arena Toluca gym, Deportivo Oceanía, Centro Social de Aragón, and especially the Baños Gloria gym at the Tepito district. Most of the new talent of the early 90s in the UWA, was indeed trained by the Villanos. When the UWA fell apart, Villano I went into semi-retirement though from time to time he appeared at a few small shows here and there. This page was last edited on 22 December 2017, at 13:36.